The area around Man, Cote d’Ivoire was a very pleasant surprise. The beautiful hills seem to rise out of the landscape like green camel backs. After a seriously long journey to get to Man, I took a couple days of relaxation before heading off on what I thought was going to be a simple climb. What I didn’t know was that my guide had his own plans for the day. I had been told that a good half-day climb in the area was a mountain basically right in Man called “Le Dent du Man“. The hike was meant to be about 3-4 hours roundtrip. So obviously, as we arrived at the peak after about 4 hours I was a little bit confused. However, I just came to the assumption that we trekked a longer route. Little did I know, my guide had actually decided to take us up a completely different mountain and a much longer hike. The mountain we ended up trekking meant a 32km round trip up the second highest mountain in Cote d’Ivoire and one of the highest in all of West Africa. The truth is that I didn’t mind too much. Yes the trek was difficult, but any day that ends with a waterfall swim at a beautiful waterfall like this, is fine by me. 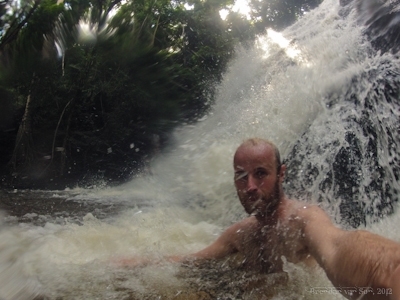 Anyways, the video of the hike and waterfall swim in Man, Cote d’Ivoire is below. I hope you enjoy it! And if you do, please subscribe to my youtube travel channel.